Unfortunately, many women feel like they are a parent to their partners as well, and lack their support. This drains their energy and causes stress on a daily basis. Marriage is as demanding as motherhood for many women, and researchers have found that an average mom rates her stress levels an 8.5 out of 10, and even 46% of the women involved in the study reported that their husbands are causing more stress than their children! Furthermore, researchers from the University of Padova found that after the death of their wives, the health of husbands deteriorates, while in the opposite case, when women lose their husbands, they actually become healthier and cope with depression and stress easier. This means that men relied more heavily on their wives. 1. First of all, partners should split their responsibilities, like doctor appointments, organizing events, homework duties. 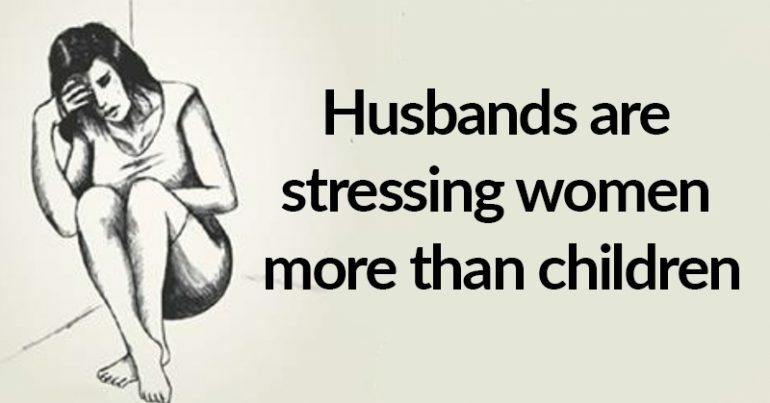 If this is not the case, start talking on the subject and explain your husband about the stress you are exposed to on a daily basis. You can make a to-do-list or a shared calendar. 2. Sometimes, men dream of being the best father and husband in the world, but their wives do not trust them enough to give them important responsibilities. Therefore, resists the temptation to do all by yourself in order to be done perfectly, and ask your partner to step in and make his contribution. 3. Many couples leave their relationship behind and mainly focus on parenthood, which is a huge mistake. Remember that you are partners and you are individuals too, so make sure you spend some time for yourself, and some time dedicated to your partner only. You need to keep this connection strong in order to have a strong basis of your family.